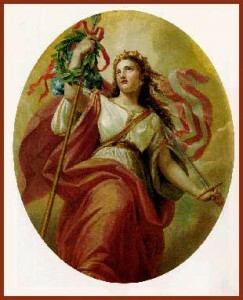 The Honorable Representative Bill Pascrell, Jr.
Re: Scheduling a Ceremony in the Rotunda this year to Present the Congressional Gold Medal to Constantino Brumidi, Posthumously and, Honoring Italy on the 150th Anniversary of its Unity with a Concurrent Resolution Vere dignum et iustum est. I humbly and respectfully ask the Speaker and his six House and Senate advisors to work together to schedule, this year, a ceremony in the Rotunda to present the Congressional Gold Medal to Constantino Brumidi, posthumously and also to recognize and congratulate the Republic of Italy on the 150th anniversary of its unity as a nation with the introduction of a concurrent resolution. I wrote six of you on September 22 (with a Cc to Speaker Boehner), laying out the case why such a ceremony would be right and just and also why not recognizing Italy would be wrong. I have not received a reply from any of you. However, I thought I would write all of you one final time, as there are there is little legislative time left this year to accomplish these two worthy measures. (I know about the complexity of arranging for such a ceremony, as I asked former House Speaker Dennis Hastert to do a similar ceremony in the Rotunda on July 26, 2005 on the 200th anniversary of Brumidi’s birth). Also, Italy’s anniversary year will be ending soon. Out of fairness, Brumidi is entitled to a ceremony now as I explained at length in my September 22 letter. Legislation to award Brumidi the Medal was signed more than three years ago. Also, as this is the 150th anniversary of Italian Unity and such a ceremony this year would highlight the strong bonds of friendship between the United States and Italy. Finally, not presenting the Brumidi Medal is a drain on the Treasury because until a ceremony is completed the U.S. Mint will not make and sell bronze duplicates to defray the estimated $30,000 cost of making the gold medal. I feel a sense of responsibility in this matter as it was The Constantino Brumidi Society which urged Sen. Enzi and Rep. Pascrell to introduce the Brumidi Gold Medal legislation in 2007. It is absolutely clear that the Congress intends such Gold Medal legislation not to burden the Treasury, but to pay for itself, by the sale of bronze duplicates. But again, this is not done until after the presentation is made. If the presentation is quickly scheduled, I pledge to make my best efforts to see to it that Brumidi’s Gold Medal does not cost the taxpayers of the U. S. any money. I will work with the national Italian-American and Greek-Americans organizations that advocated the legislation to launch a campaign to ask their members to buy, within one year, all the bronze Brumidi medals issued by the Mint. I believe that other medal recipients should pledge the same. As to the second issue, I also respectfully urge the senate members receiving this letter to introduce a resolution similar to S. Res. 212 introduced this year: “A resolution congratulating the people and Government of the Republic of Slovenia on the twentieth anniversary of the country’s independence.” However, as Italy has been a good friend and strong NATO ally of the United States for more than 60 years, which has sent its troops to Afghanistan in support of our efforts there and whereas Americans of Italian descent are the fifth largest ethnic group in America, I believe that this should be a concurrent resolution, expressing the sense of the Congress as a whole. Upon quick passage in the Senate (the Slovenia resolution was passed in two days), it will be sent to the House where, I believe, despite the new ban on ceremonial resolutions there, it would also be passed by the House with the encouragement of House leaders. (See my article in Roll Call on this ban: Guest Observer, Grano: Curb Debate, Not Ceremonial Measures, August 3, 2011, http://www.rollcall.com/issues/57_19/-207955-1.html). I respectfully submit that Congress should do no less for our great ally, Italy. Thank you for your attention. If you have any questions or suggestions, please do not hesitate to have a staffer call me at 2.364.2526.